Gaspard's Stalkers is a now-disbanded mercenary group of Orcs. When it was active, it was led by Chief Bazrag. Some Veeskhleel in Blight Bog Sump. The Glenmoril Wyrd is a wyrd of nature-witches. They worship Hircine and have knowledge of how to cure both lycanthropy and vampirism. Their willingness to cure lycanthropy puts them at conflict with the Reachmen who revere all aspects of Hircine and view lycanthropy as a blessing. The Gnaw-Root Tribe is a tribe of goblins in Shadowfen. They were enslaved and brought to the mines at Mud Tree Village, but have risen up against their masters. They can now be found throughout Mud Tree Mine and in their camp near the village, along with their durzogs. They can be subdued with food scraps during the related quest. The Gold Coast Mercenaries are a band of mercenaries-for-hire from Colovia who can be found across Tamriel. The Gold Coast Trading Company is a trading company who, among other business interests, hire out their kiosks to guilds. They are listed as the sellers of tabards in Guild Stores. They also manufacture and distribute Crown Crates. Their logo can be seen on the cards, as well as the crates themselves. Some items found within crates also contain their name, such as the elixirs, poisons, and experience scrolls. The company has an office in Anvil, and have operations within the Ayleid ruins of Garlas Agea on the Gold Coast. A related quest reveals the Gold Coast Trading Company import dangerous creatures from Craglorn. 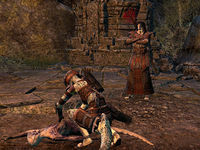 The Gray Vipers are a small gang of brigands found in the province of Cyrodiil. The Greycloak Mercenaries are a hostile group found in Craglorn. This page was last modified on 28 October 2018, at 13:05.